By Priya-Priyatama’s merciful plan, the BHAGAVAD GITA AS IT IS, Srila Prabhupada’s pure Krishna devotional edition, is the most popular and widely distributed multi-lingual edition of Gita in the whole world! Unlike other editions, Srila Prabhupada’s As It Is speaks the clear, easy to understand, gentle and at times quite forceful message of Absolute Truth. With its universal principles, philosophy, and reasonable analysis of the material world, time, action, the individual self and the Superself, the Antaryami, Srila Prabhupada’s Gita has profoundly and amazingly purified and transformed the minds, hearts and lives of millions of fortunate human beings. Srila Prabhupada was a “Gita Man” in the sense that He fully realized the essence of Gita, which is selfless service-based immaculate love divine. For Srila Prabhupada, the Gita was one with his mind, heart, words, teachings and his sterling personal devotional behavior. Thus, who would know the glories of the Bhagavad-gita more than Srila Prabhupada? I am sure my beloved Gurudeva would be most pleased that his own realized words spoken in praise of Gita were being shared with the world on the most auspicious occasion of Gita Jayanti, Mokshada Ekadashi. The following amazing statements of Srila Prabhupada will inspire, encourage, enliven and satisfy all classes of devotees. Just by reading them, many seekers of love divine will surely pick up the Bhagavad-gita, and start the most beneficial practice of reading it EVERYDAY! And for the caring and compassionate transcendental book distributors, these quotes are the perfect “lines” to use in convincing the curious to buy the book. Worlwide Bhagavad-gita book distribution ki jai! I. IDENTITY: Bhagavad-gita is also known as Gitopanishad. It is the essence of Vedic knowledge and one of the most important Upaniñads in Vedic literature. Vedic knowledge is complete because it is above all doubts and mistakes, and Bhagavad-gita is the essence of all that infallible Vedic knowledge. This one book, Bhagavad-gita, is the essence of all Vedic literatures and [very] special because it is spoken by Bhagavan Sri Krishna, the Supreme Personality of Godhead. Bhagavad-gita is a transcendental literature which one should read very carefully. One need not read any other Vedic literature. One need only attentively and regularly hear and read Bhagavad-gita. Bhagavad-gita contains perfect knowledge which comes down by the disciplic succession, guru parampara. 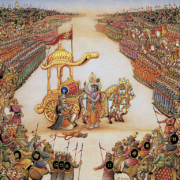 Bhagavad-gita is the essence of the Mahabharata, and it is spoken by Bhagavan Sri Krishna Himself. II. PURPOSE: The purpose of Bhagavad-gita is to deliver mankind from the nescience of material existence. All the instructions of Bhagavad-gita are intended to awaken one’s pure consciousness, which is the preliminary activity for the transcendentalist. Bhagavad-gita was spoken by Bhagavan Sri Krishna just to change Arjuna’s point of view [because Arjuna was foolishly stuck in the bodily concept of life]. The whole purpose of Bhagavad-gita is to revive our sanatana dharma, which means the eternal occupation of the living entity [i.e. Sri Krishna’s selfless loving seva]. III. READERS: Those who question why they are suffering; where they came from and where they shall go after death are proper students for understanding Bhagavad-gita. The ways and the means for ultimate realization, ultimate attainment, are stated in the Bhagavad-gita, and the doors of this knowledge are open for everyone. The Bhagavad-gita is just like a cow and its milk is the essence of the Vedas. Sri Krishna is milking this cow to feed the calf-like Arjuna. Wise men, great sages and pure devotees should drink the nectarean milk of Bhagavad-gita. The Bhagavad-gita teaches that we have to purify this materially contaminated consciousness. The Bhagavad-gita teaches that the complete whole is comprised of the supreme controller, the controlled living entities, the cosmic manifestation, eternal time and activities [Ishvara, jivas, prakrti, nitya kala, karma]. The Gita teaches that the living entity is never born and never dies. The jivatma, living entity, is eternal and indestructible. He continues to live after the destruction of his/her temporary material body. Through the Bhagavad-gita’s instructions, we are given information how to leave the material world and begin a truly blissful life in the spiritual sky. The Bhagavad-gita gives the real picture of the material world. The Bhagavad-gita teaches how to absorb the mind and intelligence in the thought of Lord Sri Krishna and thus transfer one’s self to the kingdom of the Lord. This is the art! And this is also the secret of Bhagavad-gita: total absorption in the thought of Sri Krishna. V. BENEFITS: If we properly utilize the instructions of Bhagavad-gita, then our whole life will become purified, and ultimately we will be able to reach the spiritual sky [Krishnaloka]. If one properly follows the instructions of Bhagavad-gita, one can be freed from all miseries and anxieties in this life, and one’s next life will be spiritual. If one reads Bhagavad-gita very sincerely and with all seriousness, then by the grace of Bhagavan Sri Krishna the reactions of his past misdeeds (papa karma phala) will not act upon him. One who takes his bath only once in the sacred Ganges water of the Gita cleanses away all the dirt of material life. Gita Jayanti ki jai! Srimad Bhagavad-gita ki jai! Daily Gita reading ki jai! Jaya Jaya Sri Radhe! Srila Prabhupada: Do We Have Independence?